Sarah Palin Hairstyle is Fab on Her! If you haven’t noticed, Sarah Palin, is the biggest buzz words on the net this week. She delivered her acceptance speech for the Republican nominee for Vice President right here in my home town of St. Paul, Minnesota. No, I didn’t take the trip downtown to the Excel Center to participate in the big event. I did think about it for a moment however, but then my senses came back to me and I realized I could view the whole event better right here from my own comfy couch, with popcorn, the cat, my hubby and my bunny slippers. I loved the Sarah Palin hairstyle! I loved the way she dressed and I think she clearly showed a poised confidence to be proud of. She spoke eloquently and pointedly. I admired her but don’t get me wrong, I wouldn’t care to be her. The type of juggling involved in her day to day schedule gives me the willies! I found that there are plenty of wolves out there on the net, flinging their distaste for Governor Sarah Palin, using anything they can find to pick at. When I read that a certain, supposedly la-di-da hairdresser in Boston, said, “Ms. Palin hairstyle looks like it’s 20 yrs old,” like that’s a bad thing, well . . . them there’s fightin words. 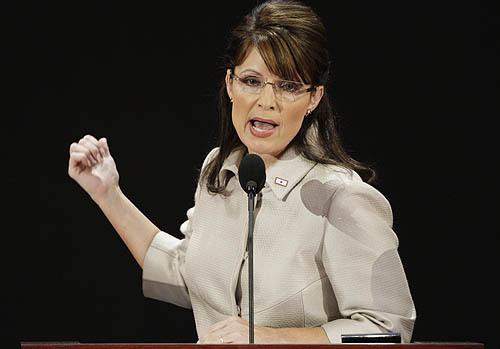 To prove how out of place he is, check out how the half up-do that Ms. Palin wore the night of her acceptance speech is . . . hot once again!! Yes this style was worn back in the 80’s and once again has made it’s debut and has recently been seen on some A list by celebrities and models. By the way, Sarah . . . your hair color was fabulous too. Check out this video by Nexxus to get a step by step on how to do Sarah Palin hairstyle the half-up. September 5, 2008 By: Barb Quinn Hairstyle Blog Leave your comments (9), Your input matters. You can like the style that someone has and still vote for someone else. Sarah Palin is very stylish and classic. I am not voting for someone based on their hairstyle. Di…There are updos all over Walmart these days. Merci, voting because of hair? ah, no. Guns, God, Babies, maybe. But not hair. To any hairdresser out there…. Offer this hairstyle in your shop and I bet you’ll be raking in the bucks. I am calling my hairdresser asap to get my half updo! Funny you would make that assumption! …You’re voting based on hair?Wow. I want Sarah’s total updo. Who can tell me how to do it??? Thank you. I loved the hair too. I thought she looked beautiful! !